The global smartphone market is in a good shape. Sure, we've seen reports of declining shipments and oversaturation in the US, but the reality is that Apple, Samsung, Huawei, and other top companies are still raking it in. Why? Two words: profit margins. You don't have to be a tech aficionado to notice the increased prices of high-end models over the last couple of years, as even casual consumers are painfully aware that they are paying more for new handsets than ever before. So why are we hearing that the big players are in such a rush to take a risk and introduce foldable phones as fast as possible to the market? Well, according to US display market research company DSCC, global shipments for foldable phones could reach as much as 53 million units annually in less than 5 years time. 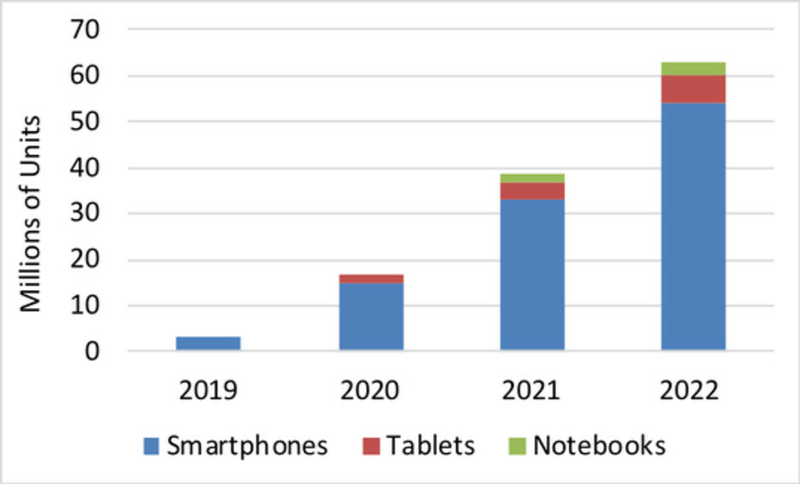 And, as the table below shows, that amounts to a lot of extra revenue - around $6.7 billion for the smartphone market alone in the year 2022. 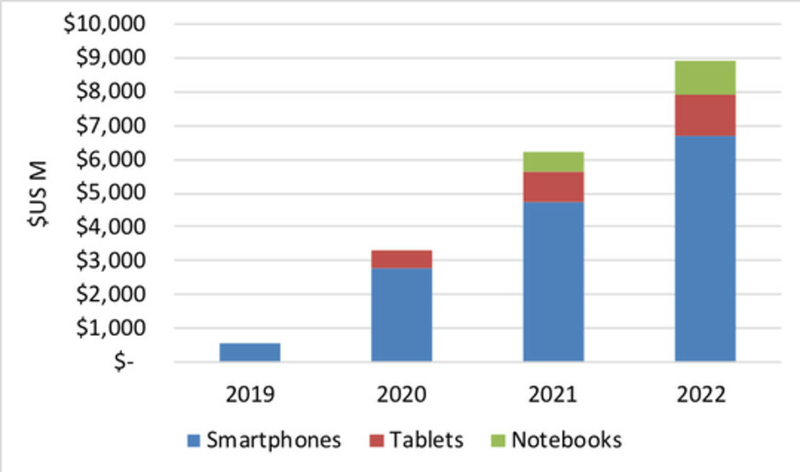 After 2019, growth will accelerate as shown in Figures 1 and 2 as costs and prices fall, availability improves and competition increases, enabling foldable displays to expand into tablets, notebook PCs and other market segments. By 2022, DSCC sees the foldable market for all applications at 63M units. The first foldable phones to come with 7.3" and 7.7" screens? During the 9 months it took to compile the report, the display researcher has apparently met with many brands and panel suppliers, discussing their roadmaps and long-term vision for foldable devices. The paper has pages dedicated to discussions with companies like Apple, Samsung, Huawei, LG Display, and Visionox. While it still might be too early to talk about possible display sizes for these future handsets, a further dive into the contents of the report hints that we could see models with 7.3-inch (2960 x 1440) and 7.7-inch (2960 x 2960) screens in the beginning. The upcoming Samsung Galaxy F foldable phone is rumored to sport 7.3 inches of screen real estate, so make of that what you will. While the possibility of pioneering the "next big thing" in mobile technology certainly sounds alluring, investing heavily in foldable phones is undoubtedly a perilous undertaking. Having a compact phone that can unfold into a tablet-like device is a neat idea, but the end-price of these gadgets might prove to be a stumbling block to consumers, at least in the beginning. It is speculated that Samsung's first foldable offering will cost between $1,800 and $2,000. These figures almost make Apple's latest iPhone XS and XS Max models look like mid-range offerings in terms of price. 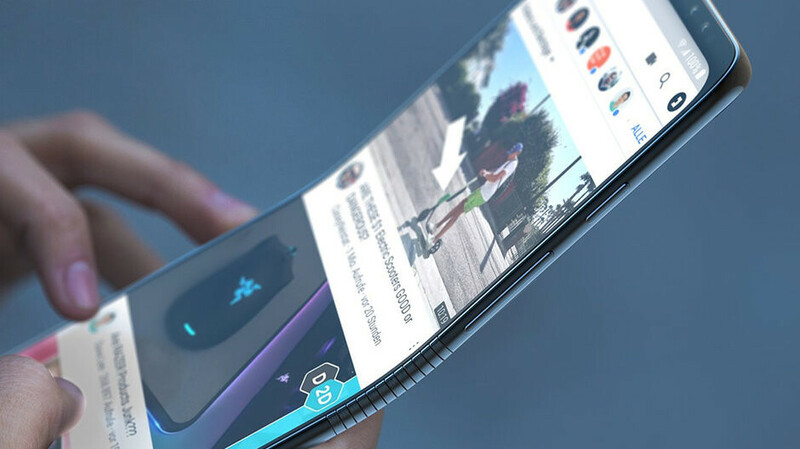 A handset with such a large display will be appealing to businessmen and gamers with deep pockets, but will the Galaxy F and its foldable counterparts offer enough unique features and functionalities to convince the average consumer? It remains to be seen, but fortunately, we won't have to wait that long to find out. What's your opinion on foldable phones? Do you see yourself buying one next year or will you bide your time and see if it's truly worthy of your money and attention? Let us know in the comments below! I will probably not buy the first generation, but eventually in a few years they will probably look like regular smartphones but unfold into large tablets, so yes, everyone will probably use one in 10 years from now. "These figures almost make Apple's latest iPhone XS and XS Max models look like mid-range offerings in terms of price." I wonder who you're trying to convince here? The readers or... Yourself? I remember when I was about to buy The Triumph Speed Triple 955i; a little over two decade ago. It was EXTREMELY hard for me to 'throw' an equivalent of $10,000 on a 'toy for boy' (As many called it) but my heart was yearning! And to convince myself; I focused my attention on my brother-in-law's brand new BMW Z3 Convertible and... Presto! The Triumph looked dirt cheap and I bought it in a heartbeat. Crashed and lost that beauty 4 years later but... That's another can of worms! G'Day! It's Samsung's failing attempt to try and out do Apple. It will never happen Samsung! HAHA! I love how obsessed you are with Samsung. You are in love. I don't think this is the future, I think no display is the future. "No display" meaning devices that will be able to project images on every surface (or create their own "surface" on thin air). iGenius, you mean holographic display? You must be super iSmart lol "No display" LMAOOOOO Apple should call it 'No display'. It's a perfect name for perfect iWinners. Holographic display is just a part of what I'm saying and it's the most rudimentary one (which proves that you're either an ignorant who is only able to see what Hollywood bad movies show him, or a limited person). Science went beyond holograms and managed to create VRD systems (see Google Glass) or BCI (see prosthetics). Now, I have only seen you trolling Apple related topics and, if you're happy doing that, I have no problem, ignoring you; I just ask you to do the same in the future so we could both be happy. Agree? Well this world needs its idiots and I see that you insist on making sure it has them. I won't be bothering you anymore with smart things. Here is a circle for you to play with - O - and here is a stick - I. Go nuts. Google Glass doesn't have a display and it's been around for a few years. What does Apple have to do with the subject? Are you one of those touched in an improper manner by a Apple logo?